CARDKEY Australia 's latest security system release, the Pegasys 1500, is ideal for small to medium-sized applications. Running on Windows 2000 Professional, the system can service a two-user network (server and client workstation). Utilising host and workstation architecture based on Microsoft Data Engine (MSDE), the Pegasys 1500 shares the same state-of-the-art GUI as the more powerful Pegasys 2000 system. The system hardware is based on Cardkey's latest CK720 (32 bit) controller, which comes standard with TCP/IP connectivity, and is fully designed to manage high volume data packet flow across the busiest LAN or WAN. With up to 48MB of RAM on board, the CK720 allows for storage capability of up to 200,000 card holders per controller. The CK720 accommodates 12 facility codes per reader, 64 time zones, 40 holidays, and eight access groups per badge holder. On board intelligence allows the CK720 to connect up to any industry standard reader technology such as proximity readers, facial recognition, biometric fingerprint readers and the very latest in Cardkey Bio smart card technology. The Pegasys 1500 software consists of three main windows: the system configuration window for system setup, the Cardholder window for day-to-day employee enrolment or badging and the alarm monitoring window with map links, to monitor the daily activities of the security system. Database entry of new employees is simplified by the compact cardholder window. With the added video imaging option, pictures can be captured and stored seamlessly, as part of the cardholder database. Direct access to badge deployment and entry of the user defined field windows is done through the cardholder main window. Security monitoring activities is done through the alarm monitoring window or directly from the interactive maps. By integrating interactive real time icons with graphical maps, facility alarms, door status, and input/output point status are annunciated. Real time door status is displayed as propped open, locked, closed or open. 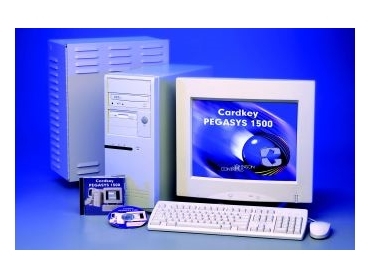 For users who outgrow the Pegasys 1500, this system can easily be upgraded to the Pegasys 2000.